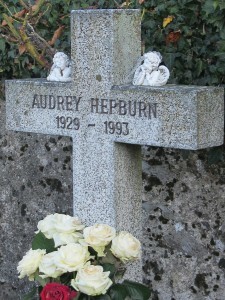 Today I took a walk that led me to Audrey Hepburn. In 1963, the unforgettable, beautiful, always elegant Audrey Hepburn decided to settle in a small Swiss town - Tolochenaz - close to Lausanne (and the city where I live). For here too, in the town of Morges (next), she married an Italian psychiatrist - Paolo Dotti - and thus have chosen to settle permanently in Tolochenaz until his death in 1993. 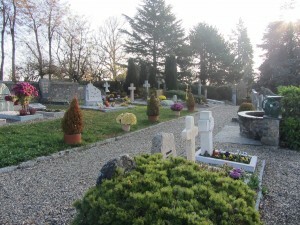 And this city is also she is buried in a small cemetery surrounded by greenery and peace. Absolutely a must for fans of Audrey! ~ By Lilia Lustosa on November 17, 2011. 4 Responses to "Visiting Audrey Hepburn"
I love Audrey and I had no idea who left us for eternity so close here. Thank you for saving us from ignorance His blog is full and has recommended a lot. Kisses!